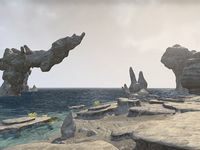 The Sea of Pearls is a large body of water found west of the Abecean Sea, off the coast of both the provinces of High Rock, and the Summerset Isles. Underwater in the Sea of Pearls lies the kingdom of Ul'vor Kus, which is ruled by the Sea Sloads. A more reclusive and mysterious sect than the land Sload of Thras, who use the coral from the Sea of Pearls in their magic. The continent of Yokuda is also found along the Sea of Pearls, along with the southern islands of Nalonga and Ravan. The island of Kevalla is also found here. North of the Sea of Pearls is the Azurian Sea. Following the dreaded Thrassian Plague in 1E 2200, the Colovian King of Anvil, Bendu Olo amassed an army consisting of various kingdoms and fighters from all over Tamriel to attack the Thrassian Archipelago in the Sea of Pearls, in vengeance for their disease. The All Flags Navy suffered from heavy storms, more as they approached Thras. They were ultimately successful in their battle against the Sload, sinking the archipelago and slaughtering most of the slug-folk. Sometime around 2E 582, Captain Margaux was a wealthy merchant-explorer from the city-state of Daggerfall that disappeared after sailing into the horizon, and into the Sea of Pearls. This page was last modified on 18 January 2019, at 21:24.